My latest post for Caught By The River was published recently, for my Wandering the River Taff column. In it, I explored the history of Clarence Bridge, which connects the wards of Butetown and Grangetown. I always end up doing about ten thousand percent more research than I can fit in the columns, so get ready for all the interesting extra bits I couldn’t cram in. A wooden swing bridge went over the Taff, about a hundred or so metres south of where the bridge is today, joining ‘Lower Grangetown’ to the Docks. This bridge connected the areas from 1861 to 1890 – the period when the docks started booming. Increasing numbers of people started using the bridge to get to work from Grangetown, but the Taff Vale Railway Co leased the bridge privately, and started charging for its use. Towards the top right of the picture, you’ll see James Street running horizontally across (it’s where you’ll find the police station today). If you stretch that line out directly to the left, you’ll find the current location of Clarence Bridge. I did quote from the wonderful Grangetown Cardiff’s history section in my column, but I didn’t manage to get all the details in. On the day they introduced the toll, local residents rioted and threw the bridge’s gate off its hinges and threw it in the river. The Times reported that 1,000 men took part in the protests each day against the railway company. There had been “upmost good humour” for the most part, as 200 police stood by, but then there was direct action. “They rushed at the newly-erected toll gate and tore it from its hinges, throwing the structure in the river.” The first gate was replaced the following day, as well as a sentry box for the toll-keeper. The toll house was also damaged. The paper later publishes court reports of three men who were arrested for causing the damage, costing £5 – Cornelius Dacey, William Smith and William Webb, all under 23. Police were also after another man called William Drew, who was heard to shout “Go it boys, that’s right, pull it off!” The court was told of “200 armed navvies with iron bars up their sleeves.” The three were found guilty and the judge expressed sorrow at having to sentence them to a month’s hard labour. Eventually the Cardiff Corporation relented to the chaos and built two proper public access bridges – Clarence Bridge, which spanned the River Taff, and the James Street Bridge, which spanned the Glamorganshire Canal. You can see both these bridges appearing in maps from 1898 onwards. Also note the original wooden swing bridge has disappeared – been dismantled by this point, leaving Hamadryad Road cut off abruptly by the Taff. If you want to see the location of the original wooden bridge, head to Hamadryad Road on the Butetown side. You can’t reach the Taff directly as there’s a big fence up, but if you face the water, you’ll be standing roughly where that original bridge was – well over 100 years ago. It had cost £60,000 when it was originally built. 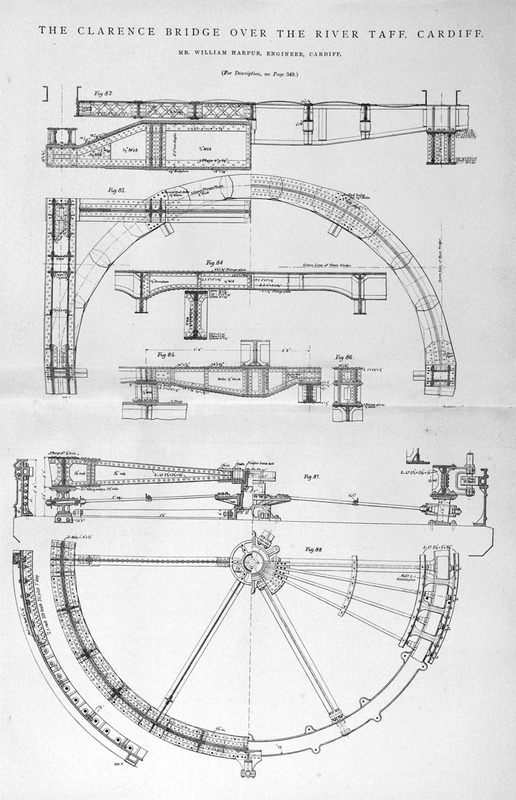 Grace’s Guide shows the original plans for the bridge, which was designed by William Harpur. I’d never heard of him before, but turns out he’s a fairly important figure in Cardiff’s modern history. 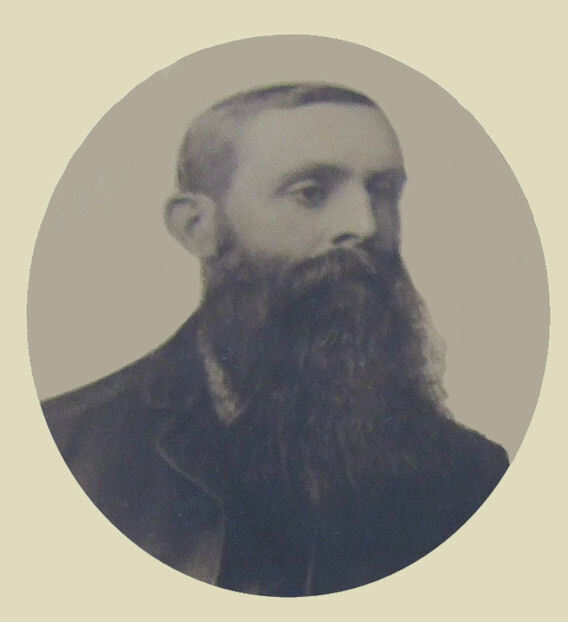 William Harpur, the bridge’s engineer, is not really a household name, but modern Cardiff has his fingerprints all over it. He was appointed Borough Surveyor in 1883, and as such had final and ultimate say over all proposed street layouts and individual buildings that were going up through the city’s boom years. If you’ve walked down Castle Street, visited Cardiff Indoor Market, or been to Roath or Victoria Parks, you’ll have first hand experience of his work. There’s also the civic centre at Cathays Park, the widening of the Hayes and Working Street. He built the city’s first municipal hospital (the Hospital for Infectious Diseases – later Landsdowne Hospital) and also the Pumping Station – now an antiques market. Harpur was also engineer to the tramways department, and carried out the construction of the track for the electric cars. As his obituary so delicately puts it, his mark is left on the lay-out of every inch of modern Cardiff: all the plans of new roads, buildings, bridges etc having had to receive his approval. Bit of a hero, William Harpur. Good beard too.